Where is the ceiling for BRICS? Cooperation within the BRICS grouping will intensify, and this process is conditioned by objective reality and global political and economic trends. “The BRICS integration process is not a result of U.S. and EU sanctions (over the Ukrainian crisis). Rather, it is due to objective reality and current global economic and political trends. Set against the backdrop of the culmination of a series of economic and political cycles, the Ukrainian crisis is only an indicator, not a catalyst for change in the global paradigm,” said Dmitry Ontoev, an analyst at the SKOLKOVO Institute for Emerging Markets Studies. The joint statement by BRICS members on the sidelines of the Nuclear Security Summit at The Hague in March was the first step in establishing a common foreign policy. China, India, Brazil, and South Africa expressed their understanding of the historical aspects of the situation in Crimea, underscoring their opposition to the sanctions leveled against BRICS’s fifth member, Russia. Ontoev believes that the BRICS grouping will become one of the most important political and economic alliances thanks to one important factor – the full sovereignty of each participating member. All five countries can pursue an independent policy, not limited to any alliance or association and have sufficient economic capacity and weight to ensure these policies. “BRICS members are natural allies,” Maxim Pleshkov, senior analyst Russian rating agency RusRating, told RIR. “Where Russia conducted its policy alone in the G8 club, BRICS policy promotes the policies Russia shares with the other member countries of the partnership,” he said. According to Pleshkov, BRICS member countries hold the same position in three basic areas. First, all BRICS members strive to modernize their economy while simultaneously addressing social problems; whereas the West is concerned primarily with the concept of sustainable development. Second, BRICS wants reform of the international monetary and financial system that was developed after World War II, resulting in the U.S. and its Western partners being the dominant forces. BRICS member countries want to gain a position that would be consistent with the increased role of their individual economies in the world. Thirdly, BRICS member countries have consistently advocated the strengthening of international law and the primacy of the UN. These shared goals can be used as the foundation for developing a joint BRICS policy. “We should not forget that BRICS economies are mutually complementary. Member countries are spread out over all continents, and the total size of the BRICS market is more than 3 billion people,” Pleshkov added. In order to realize the huge potential of the association, Ontoev believes it is necessary to create joint management institutes and discussion and decision-making bodies and to coordinate policies and procedures, as is the practice in other, more structured and formalized international associations, such as the Shanghai Cooperation Organization Secretariat or Eurasian Economic Commission of the Customs Union. Currently, participating member countries are finishing talks on the development of a general program. Many initiatives have already been outlined, including, in particular, the Russian draft program for developing a strategy of economic cooperation among BRICS members. Included among its key provisions are: an expansion of trade and investment ties; technological innovation and the development of BRICS industrial potential; ensuring BRICS energy and food security; development of transport and communications, as well as innovation and technology exchange. Therefore, a thoughtful and reasoned draft program already exists, and the main risk in not the development of an economic strategy but rather its adoption and subsequent implementation. Maxim Pleshkov is certain that BRICS should consistently develop the interaction that has already been initiated, and he sees the creation of credit and financial institutions (a development bank and currency reserves totaling $200 billion) as the next logical step. He also believes it would be useful to create various research centrEs for BRICS-related issues and increase integration of the member countries in various sectors of the economy. 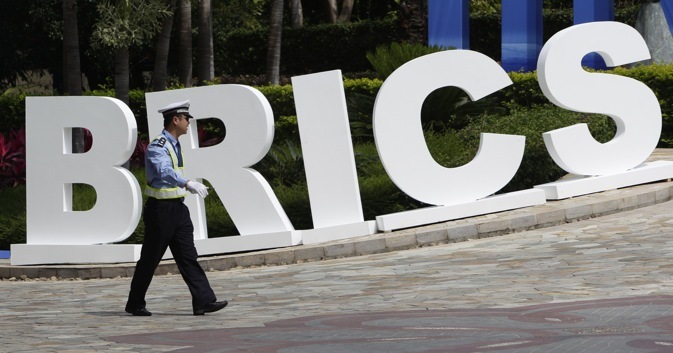 However, Russian analysts who participated in a RIR survey demonstratied conflicting views on the prospects for expanding BRICS. In particular, views differ on the possibility of Argentina’s inclusion in the association. Pleshkov believes that Argentina shares the core BRICS values and should be invited to join the group. Its inclusion, among other things, would reduce U.S. influence in South America. The Skolkovo representative, in contrast, believes that it is necessary for BRICS, primarily, to deepen the integration between the existing members and to institutionalize their cooperation. Otherwise the grouping risks facing an erosion of its economic competence, and becoming, if not simply a debating club, an amorphous political alliance. “The opportunities that BRICS offers Latin America are enormous, and in order to realize this potential, it would be more practical for the five to maintain a policy of concerted action in this part of the world, which can be spear-headed by the inclusion of one of the region’s countries in the BRICS association. This does not negate the need to develop a multi-stage format of participation in the organization and the involvement of other countries as observers or partners,” said Pleshkov. As for the problems BRICS faces, the Skolkovo analyst believes one of the main challenges could be the cultural differences between the participating countries. “BRICS, unlike the EU or ASEAN, unites different cultures, and all its far-reaching and potentially significant initiatives in the economy may fail because of different approaches to the same issues and processes, and, moreover, because of different ways of thinking. Therefore, one of the most important initiatives of BRICS should be the enhancement of cultural, scientific, and educational exchange among the group,” he said. According to the analyst, if the development of human capital through the humanitarian integration of BRICS is successful, the member countries can work together effectively to implement projects on an entirely different scale and look for answers to the global challenges of the 21st century, including the exploration of space and inaccessible regions of the Earth, global food, and energy security.